So blares the front page of today’s Daily Mail. Except, of course, its not true. The percentage of people Found Fit For Work is 39%. This figure includes those whose claim is closed before assessment is complete. Which does come to 75%. So the Mail’s headline should read ‘39% of Incapacity Claimants are fit for work and 36% did not complete their claim’. However, the DWP does not track the 36% of people whose assessment is not completed. We don’t know if they have found work, gone onto JSA, died, decided not to go ahead with the claim due to the complexity of the forms or fear of the medical, or any one of a number of reasons. In addition, over 25% of ESA decisions are appealed. There were 50,000 in the first 18 months after ESA being brought in. Over 70% of those appeals are successful, according to Citizens Advice Scotland. 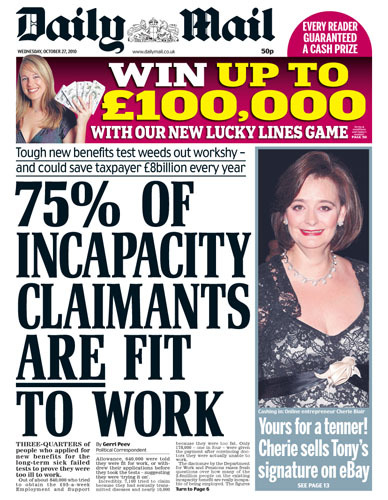 The use of the word ‘incapacity’ in the headline is implying that 75% of those on Incapacity Benefit are fit for work. As these statistics are based on NEW claimants of ESA, not on those on Incapacity Benefit, this is blatant propaganda. Still not convinced? Have a read below of the opinions of Liberal Democrat, Scottish Nationalist and Conservative MPs in a debate in May this year. I’ve highlighted a few paragraphs in bold if its a bit wordy for you. “I thank the members who have supported the debate by signing up to the motion and those who are here to contribute to it. I must also thank Citizens Advice Scotland for its help in providing the information that I needed, and congratulate it on the report that it has published—”Unfit for Purpose“—which shows clearly the stark reality of why the employment and support allowance needs to be reviewed. As the report and the motion say, the purpose of a sickness benefit system should be twofold: it should support people who are able to work and help them into work, and it should give those who are genuinely unable to work the reassurance and support that they need while they are ill. In those two circumstances, the ESA has clearly got the balance wrong. Citizens advice bureaux across my region and, indeed, across the country are finding case after case of people who are clearly too ill to work but who are being threatened with withdrawal of benefits unless they find a job. They are being let down by a system that was supposed to exist to help them. We need to get one thing clear from the outset: these people are not scroungers or benefit cheats, but ordinary people like you and me who have suffered the tragedy of either short-term or long-term ill health, or who have chronic conditions. That can happen to any one of us. In many cases, they are people who have worked all their lives, in some cases for decades, and have paid into a national insurance system and taxation system, which they legitimately thought would be there for them if they were ever unlucky enough to need it. Now, for far too many people, that day has come and they are bewildered to find that they are being denied the support that they thought was their due. We are not talking about odd, isolated cases; the evidence from citizens advice bureaux shows that there is an endemic failure of a benefit system that is clearly fundamentally flawed. That must cause all of us some concern. The ESA was introduced in October 2008 to replace incapacity benefit and income support based on the ground of disability. There are 11 citizens advice bureaux in the region that I represent. They are part of the network of 73 across Scotland, all of which offer an invaluable service to the communities that make up our nation. In the 18 months since the introduction of the ESA, each of those bureaux has reported growing numbers of cases of ESA claimants who have been put through horrendous and inadequate medical assessments, which have often taken no account at all of their actual condition, which have ignored evidence that has been submitted by the clients’ general practitioners or those who have been working with the claimants for a long time, and which have resulted in completely arbitrary decisions that have denied claimants the support to which they are entitled. Crucially, the decision on whether to award ESA is not taken by medical professionals who have knowledge of the client’s history. As was shown on the BBC documentary on the subject last night, the process has been farmed out to an independent company that is there to get results. Fundamentally, those results seem to be based on the desire of the Labour Government at Westminster, which introduced the system, to reduce costs. The system has proved not to be conducive to fair decision making. Repeatedly, we hear of severely disabled people—including cancer patients, people with long-term conditions, people in wheelchairs and people with severe mental health problems—being subjected to five-minute interviews by someone sitting behind a computer who, far from asking them about the detail of their condition, does not even make eye contact with them and is interested only in a box-ticking exercise on the screen in front of them, which allows them to decide that the person is to receive no payment or support. Some 68 per cent of ESA claimants are found to be fit for work. Of course, many clients appeal those decisions. The Department for Work and Pensions originally predicted that there would be 21,000 appeals against ESA decisions but, in 18 months, there have been 50,000. Of those, 70 per cent have been successful. That is a clear indication that something is wrong with the system. The time that is taken up by those appeals is enormous. Some CAB advisers have told me that up to 80 per cent of their time is now taken up dealing with ESA appeals. That is time that they cannot spend dealing with other clients. The other issue involves clients whose ESA claims are rejected and who are so distressed or upset that they do not appeal, perhaps because the stress has aggravated their condition. What happens to them? We have heard of awful cases, including more than one suicide attempt. However, that is not the entire issue. The CAS report rightly asks that there be an immediate investigation into what happens to people whose appeals are rejected and who subsequently disappear from the system. The current picture is bad, but it is likely to get a lot worse. By 2015, all of the people who are currently on incapacity benefit will be moved onto ESA, and the problems that have been identified by CAS and by MSPs in addressing the concerns of their constituents are only going to get worse unless the matter is addressed now. We cannot allow that to happen. We must have an independent review of the ESA, and the DWP must implement the recommendations that have been made by Citizens Advice Scotland in its excellent report. If we do not stand up for the genuinely sick and disabled people of Scotland, what are we here for? As Hugh O’Donnell mentioned, there is widespread concern from, among others, Citizens Advice Scotland, Macmillan Cancer Support and the Scottish Association for Mental Health about the high number of people—almost 70 per cent— who are being refused outright any entitlement to ESA. Benefits are for people who require support in order to meet the costs of everyday life when they are unable to do so from any other source of income. When people are disabled or ill to the point that they cannot work to support themselves, it is a duty that is incumbent on society to provide such benefits as will alleviate pressing financial need. It is unacceptable in a civilised society to pressure people off benefits and towards work for which they are unfit, purely in order to cut the number of benefits recipients. However, that is what the Department for Work and Pensions is doing, in conjunction with its partner business, Atos Healthcare. Citizens Advice Scotland has highlighted the 68 per cent of claimants who have been rejected for the employment and support allowance. It points out that two fifths of its ESA case load is made up purely of those rejections. Macmillan Cancer Support points to the cancer sufferers—including terminally ill patients—who have been told that they are fit for work. SAMH points out that Atos has made recommendations of fitness for work for people with serious mental health problems without giving consideration to reports from their general practitioners, community psychiatric nurses or psychiatrists. We have heard of one case in which a man with serious mental health problems was passed as being fit for work by Atos, without any reference to his GP. He then took an overdose of pills, as his evidence had been denied and his benefits removed. That is not by any means an isolated incident, but it is utterly intolerable. The Daily Mail today described all those who were rejected for ESA as “scroungers”. That is front-page news for the Daily Mail. It contained no analysis of the evidence, which is nothing new for that newspaper. …The CAS report has identified three main problem areas with the ESA system: the administration of ESA, the work-capability assessment and the experiences of claimants after the work-capability assessment is complete. In the time that is available to me, I will focus on the administration of ESA and the application process. The CAS report reveals that claimants have received inaccurate advice from some Jobcentre Plus staff and that that has resulted in the wrong benefit being claimed. The claim is then rejected, which adds to the problems that are experienced by the claimant and puts them in an even more vulnerable position financially. Difficulties have also been experienced with filling in the application forms and, worse still, documents have been lost by the DWP, which has caused further anxiety for claimants and has delayed their payments. On top of all that, the processing of the claims has not been efficient, which has led to further claims having to be made from the social fund, or to claimants having to look to relatives or friends for financial support. Furthermore, as a BBC freedom of information request revealed, under the Labour Government 8,000 ESA appeals were being heard every month. To put that figure in context, it is double the number of appeals that are made in relation to disability living allowance, which is the second most appealed benefit and which has seven times more claimants than ESA. By any standards, it is a bureaucratic nightmare that is taking up valuable resources and adding to stress for all the vulnerable people who are affected. Another Universal Benefit is hit. Sadly too many people beleive everything they read without reading inbetween the lines! I’m one of the 37%. Been left with no monies since April as through Mental Health issues and issues relating to over 3 years of discrimanation from DWP regarding my efforts to get back into work left myself to taking a brake down and being hospitalised for 3 months. I went to attend that assessment on the day got to the door but couldn’t go in. There has been no letter of offer of a home visit as what stated on the goverments website nothing. The resulting effects are that i’ve carried on trying to help others on sites such as this by highlighting the effects those cuts are doing. Behind the scenes my mind is focused towards suicide that’s my reality that’s been my life for all those months. My body is very weak now as i haven’t had the monies to feed myself proparly. If goverment has set a pleadge to help people with disabled then they should be searching out that 37% as i don’t believe for one minute i’m alone on this senario. They have the names they have the addresses of that 37% but they do nothing towards there error on bringing those assessments about. Even a way back in April got no help whatsoever when i went to social work dept. and explaining my situation. I have enough medication now to sink into a deep sleep that time will be determined when council decides to take the house from myself as there are no monies to pay for rent or council tax. I have also been sitting with no Gas for about 4 months now. No laughing matter when one jumps into ice cold water to have a wash. Nor is it very comfortable to have to wash ones hair with soap as no monies for basic toiletries. washing machine has also broken down so having to ware damp smelling cloths all the time which makes it very difficult to go out. My family phones from time to time but i can only keep delaying them as i can’t bare to allow them to see myself in this situation. I ended up at accident and emergency due to cronic levels of pain both migraine and sever levels of stomach cramps. Was referred to a doctor but it’s taking months to get things sorted out, not much more that i can take. Be glad when it’s all over now. It sounds like you’re in a terrible situation. Do you have anyone giving you help with your situation? The Citizens Advice Bureau? An Advocate? A care coordinator or doctor? Its clear that you need help. You are entitled to financial support, and there are people out there who can give you assistance. I live in the UK and I have a collection of mental health related labels. I've been out of work for 6 years, after some time in bookselling. This site is an attempt to keep on top of the many changes happening to welfare and services, and how they are affecting people with disabilities and mental health problems. I also blether about other things that may or may not be of interest to you. DWP IB Reassessment Q+As for Healthcare Professionals. WCA (ESA) Mental Health descriptors. Work Capability Assessment Internal Review, DWP. March 2010. DWP Consultation on ESA and Work Related Activities. Have your say. DWP official review of ESA Work Capability Assessment. July 2010. Universal Credit: welfare that works. CQC Report on the Mental Health Act. Oct10. Benefits Cuts – Your Stories. BBC. Benefits Test Unjust Say Charities – Guardian. Cheer up love, it might never happen. Disability: We can all do better. Naomi Jacobs. ESA – A new harsher test. Govan Law Centre – Chancellor's Further £4bn Benefits Cuts 'Ruthless and Reckless'. I've got ME, I'm not a benefits cheat. Is Welfare Reform Worth This? The disability benefit reforms fail the liberal test. Thousands more could be stripped of incapacity benefit. Why Osborne's benefits crackdown won't just hit the workshy.